If you ever scanned the radio dial listening to people talk about celebrity gossip, sports, news and politics, and wished you could listen to folks talk about boating, we found a radio show that's perfect for you. 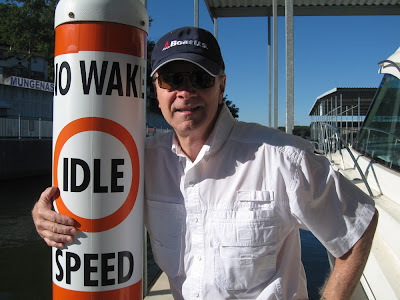 Bob's "No Wake Zone" Radio Show covers just about everything about boating, or as the show's website puts it, "kayaks to cruise ships - ropes and knots and megayachts." The show broadcasts locally throughout the Lake of the Ozarks area in Missouri, and, like most popular radio shows these days, streams live on the internet all over the world so you can listen from ANYWHERE. This is a good weekend to tune in, as our friends from Dogs Ahoy will be included on this weekend's edition of the show. The show airs on Saturdays, from 7 - 8 a.m. Central Time (that's starting at 8 am here in New England). You can listen to the live show or check out archives online at www.BobsNoWakeZone.com. the Dragon Cup Watercross at Lake of the Ozarks. and another cruise ship in hot water...and his time it is NOT Carnival. 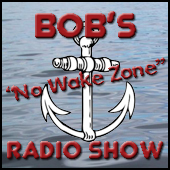 We've made listening to Bob's No Wake Zone a weekly routine and hope you will, too! The show can be heard via live streaming audio via links at www.BobsNoWakeZone.com, or if you are local to the Lake of the Ozarks area, you can listen on KDKD FM or 104.9 KXEA FM.